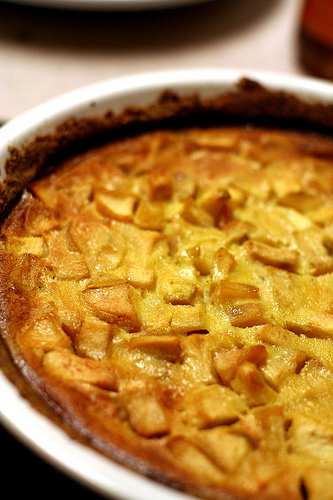 THE SLIGHT PEPPERINESS OF SAVORY is a pleasing accent to the smoothness of custard, and the sweet-tartness of apples. Summer savory goes well with many fruits: peaches, apricots, and cherries in compotes; pears, peaches, apricots, and apples in jellies, jams, or butters. 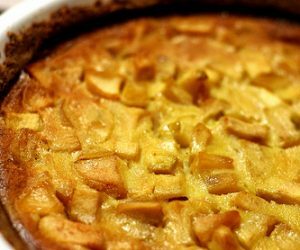 Firm-ripe peaches or pears could also be used in place of the apples in this recipe. Scald the milk with 6 savory sprigs and let the mixture stand for 30 minutes. Generously butter a 10-inch glass pie plate or ceramic quiche dish. Peel and core the apples and slice them thinly into a bowl. Toss them with 1/4 cup honey, the lemon juice, cinnamon, and nutmeg. Remove the savory from the milk and squeeze the extra liquid from the leaves. Combine the eggs, egg yokes, and 1/3 cup honey in a bowl. Whisk the mixture until blended. In a slow, steady stream, pour the scalded milk into the egg mixture, whisking continually. Preheat the oven to 325ºF. Drain the apples, reserving the liquid. Arrange them around the bottom of the baking dish in overlapping concentric circles. Strain the custard through a fine sieve and pour it carefully over the apples. Place the baking dish in a larger dish and add hot water to a depth of half the custard dish. Bake about 35 minutes, testing with a cake tester for doneness. Remove the custard to a rack to cool. After the custard has cooled to room temperature, gently loosen the edges with a spatula. Slide a flat platter over the custard dish and invert the custard onto it. Pour the reserved apple liquid into a small saucepan and add the remaining savory sprigs. Bring the sauce to a simmer and cook on low heat for 10 minutes. Serve the custard at room temperature and pass the sauce separately. The custard may be made ahead and refrigerated. Allow it to stand at room temperature for 30 minutes before serving. If you refrigerate the custard, reduce the sauce while the custard is standing.